Exclusive saddle design eliminates contact with metal surfaces and sharp edges. Angled for easy loading. The TROY Lite Storage Rack holds 20 full sets of TROY Light Workout bars and weights. This newly-designed rack will fit well in any group exercise room. Weights are not included. 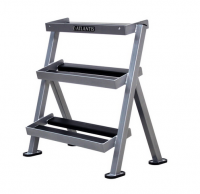 Open-front design gives users freedom of movement, As shown with integrated spotter stands, adjustable safety bars and chin-up bars, plus bar, band and weight storage. J-hooks made of high-density polyethylene (HDPE) to protect bar knurling from scratches. 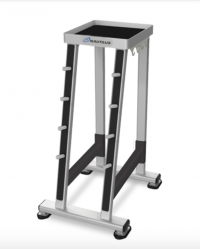 Visual height indicator and colored locking pin make bar-level changes quick and easy. Available as 2.1 and 2.4 m / 7' and 8' tall configurations. Dynamic Fitness products are designed to offer the industry with the best built products within the athletic and fitness arena. Leading the way is our premium Edge ¾ Rack which brings superior quality, function, and versatility to any training facility. By offering custom features with ground breaking innovative designs, our products give your facility the foundation for success. Our Modular Annex Rack offers all the features of an Olympic station (available in 2″x2″, 2″x3″, & 3″x3″ to fit your budget) with the ability to add storage and connect additional units as a site feels fit. Training stations come standard with many features plus a wide variety of attachments to fulfill every site and station need. Urethane protected surfaces, Accommodates multiple handles and accessory bars, Top tray with rubber base for storage of smaller items.